Have you noticed all of the brown and gray color combinations being used together lately? Not only have I seen more gray painted walls with chocolate brown furnishings, I have also noticed that lately a number of designers have been using gray with stained woodwork. And we know Mother Nature is always perfect with her color combinations! I have found if you are working with dark browns such as espresso or walnut in your wood tones, stains or furnishings, almost any silvery gray with blue or green undertones will work. A couple of my favorite grays with blue undertones are BM Sterling 1591,Pebble Beach 1597, Silver Lake 1598 and Winter Solstice 1605. A few beautiful grays with green undertones are BM Revere Pewter HC-172, Edgecomb Gray HC- 173 and Manchester Tan HC-81. A lot of people have chocolate brown sofas and chairs and it is always nice to find color alternatives to use. Gray is fresh and clean and can really update your room. It is also great to have a new color option to use with stained trim. Have you used a gray on your walls to work with your stained woodwork or brown furnishings? Do you agree it is a great color combination? If you guessed arm chair rests, you are correct! I was amazed! David said that he had a friend with a leftover box of these armrests and asked if he could have, even though at the time, he did not know exactly what he was going to do with them. He started playing around with them one day until he noticed shapes taking form. To hang them on the wall, he inserted a small 2-3” wooden dowel in the back of the piece and made hole in the wall to stick the other end of the dowel. The pieces are pretty light and he said they have held up just fine. I think they are just so creative! Did you notice what the eyes are made from? David has been very successful with his business since he opened two years ago. He understands that his customers lead a busy, stressful life and it is a special treat to come in to be pampered. He strives to make the customers time special and relaxing. He also believes in treating his employees well so they too have a great attitude and want to make the customer happy also. The picture just does not show how cool they look. He hung a rectangular smoke mirror on the wall, then in the center of that mirror he hung a round regular clear mirror on top. I am so inspired that I am trying to find somewhere to hang this in my home because I am going to make one for me! I love them! So cool and different. I was so impressed with his work that I asked if I could share with my decorating friends! He is so talented and resourceful, don’t you think? What do you think of the mirrors? Have you ever seen anything like that? I hope you enjoyed! David and his incredible talent can be found at his salon ‘ENails’ in Slatersville, RI. 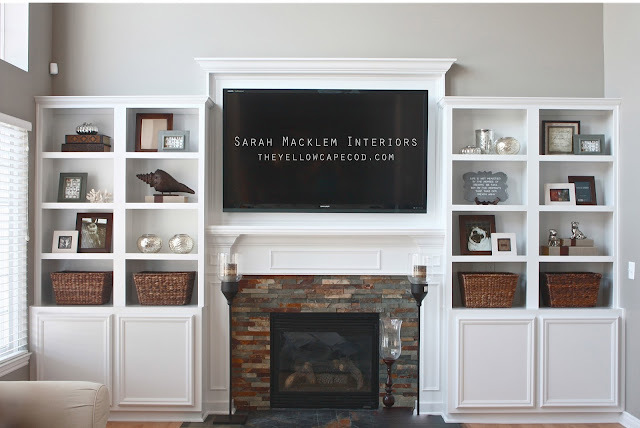 If you need help decorating your space, contact me today! Sofa In Front Of The Window? They are worried that the sofa will cover up too much of the window and block the view. But if you think about it, the average sofa is only 32″ inches tall and measuring up from the floor that is not going to cover much of your view or window. It is amazing how much the room opened up and feels so much more welcoming. And I love sitting so close to the window and looking out (yes, the red rug is going). So if you are thinking of rearranging your furniture in the living room, try putting the sofa back against the window to see if you like the look in your room. I am so glad I tried it. I really love walking in the room now because it feels so open and welcoming with a gorgeous mountain background. Do you agree that the sofa looks lovely facing into the room? It is such a welcoming space now. I love it! She was very happy with everything and is going to purchase the items over time. I just wanted to share with you! 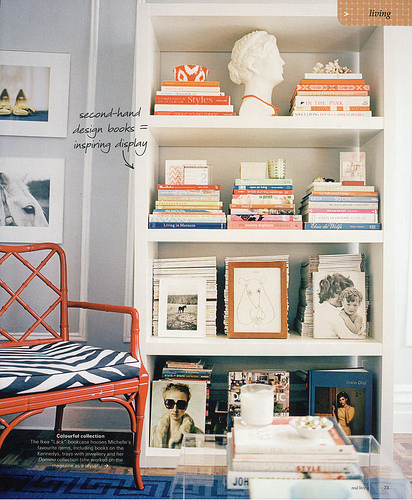 Don’t you love looking at inspiring photos of beautifully styled shelves? You know how I love vignette’s!here, here & here. Chris over at “Just a Girl” is an amazing DIY’er and blog extraordinaire designed the bookcase above. Isn’t it beautiful? 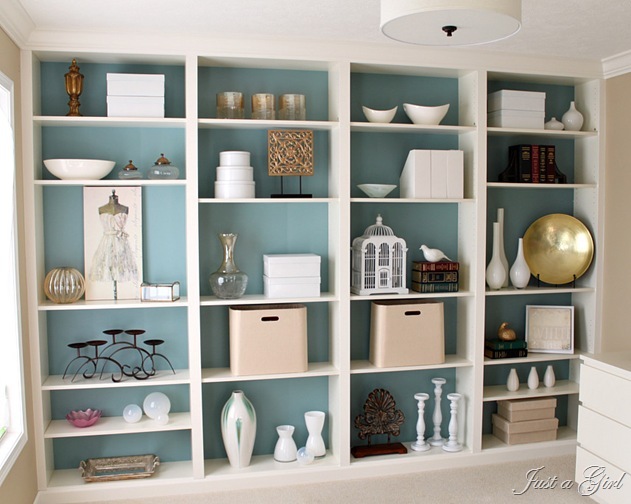 She shares the DIY instructions on her website on how to build the actual shelves here. I do love the look. Although there are not many books on the bookshelf! Is that practical for our own homes? I have a lot of books. I would like to keep them on the bookshelf, but then I wonder if all of the books crammed on there will not look as pretty! Not as pretty, but very practical. And I do see a couple small accessories on that bookcase above! There is no magic in decorating bookshelves. As I posted here, there are no set of rules as to what is a right or wrong way to decorate a flat table surface. Many times it only requires patience and plenty of trial and error to get it right. Another common item that I love in all these photos are all of the white objects. Linking to Serenity Now Friday Link Party here! A reader recently wrote and asked if I would please share some ideas and inspiration on how to decorate a round coffee table. You would not want to overwhelm the top with too large or too tall of an accessory that would throw off the balance. And the opposite holds true for decorating a large round coffee table- keep your accessories on the larger size. But the most important key in decorating your table is that you like the look. Everyone has different tastes and styles (thank goodness!). Someone might love one decorated tabletop when another person will think it is not so great. Who cares? That’s it! I love the finished look and that is what is most important! Remember that it takes patience and plenty of trial and error to get it right sometimes. Just step back and take a look to see what else you might need to add or need to take away. I hope I have helped give you some new ideas and inspiration for decorating your round coffee tables. I have noticed a lot of my clients are requesting the round coffee tables lately instead of rectangular. Which do you have in your home? Linking up to Serenity Now Weekend Link Party!